In 1.9.2 we are seeing a deepening of the combat system and potential strategies in regards to armor having different resistances and vulnerabilities. 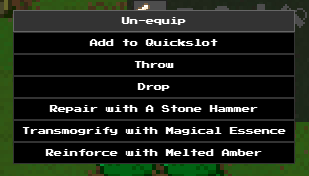 This follows the same model as damage types for your weapons against monsters; now monsters also have a damage type or types against you and your equipment. Combat messages will reveal if you are properly equipped to take on each foe, just like in the last version where it displayed if your weaponry was effective against them. This will most likely be the end of the line release before beta 2.0, which will ideally see the long-awaited Steam release. There’s still a lot of things up in the air about that, so I can’t reveal or comment on too much of it. The offline/downloadable clients would not allow mods to be loaded (node-webkit issue). Quality of tiles did not transfer between setting down and digging/gathering them back up. Slime Gelatin would decay into Rotten Meat. Attack and defense values would not be updated after an un-equip. When attacking a creature, you will no longer also pick up items from under it in the same turn. Water routing ability (digging adjacent to water) and chances now depend on how much water you are trying to route and dig from. If the pool of water tiles is too low, it will not be able to spread naturally; however, above that, the chance for water to route is based on the amount of water tiles in the pool. The more water, the easier the water is to route. There is now a 32 and 64 bit versus for the offline OS X version of Wayward (previously only 32-bit). Fixed the tile/world perspectives on Forge and Anvil and Wooden Chest and a few other miscellaneous graphic edits. 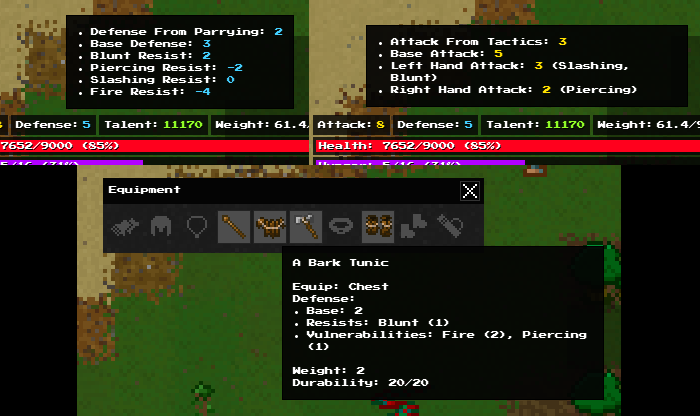 Armor now has specific vulnerabilities and resistances and monsters now have damage types to be used in conjunction. Attack and defense labels now have hover-over information which includes a more in-depth break down of damage types, resistances, vulnerabilities and skill bonuses for each. Transmogrify, Repair, Reinforce, and the new “Preserve” now show up in each item menu to specifically perform item on item action instead of having to drop the item on the ground to perform the actions. A new “Preserve” ability has been added to be used on extended the life of foods. 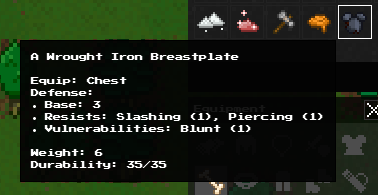 A few new items including a unique, rare weapon and a new resource (and tile). Nice! Congrats on the RPS article as well!! Hey I’ve encountered a bug on offline version. I made a small bag and open it without equip it. I stored a log and when I tried remove it a error occurred and prevent it and corrupted to the save(New world, inventory, skills, stats expect talent points) so I cannot provide you a save. We don’t have any plans currently for multi-player. We are focusing on single-player and making it the best it can be. Hungry monsters have a chance to go away, or lose interest over time, but coming up in 2.0, they may try to break in to your house! So you may want to try to lead them away instead. well… it is a turn based game… maybe if you add time to it? would change the entire game.